It is common that you would want to manage and edit/remove some contacts from your inventory contact list especially when your customers are no longer available or moved. BMO Online Inventory Malaysia provides this basic function that enables you to either edit or delete a contact. In this tutorial, we will guide you on how to edit or delete a contact in BMO Inventory System. 1. Go to Contact > Contact List to either edit or delete a contact. 2. Now, you are able to view a list of contact saved in your system. Click Edit on the right hand side of your screen to edit your customer contact’s detail. 3. 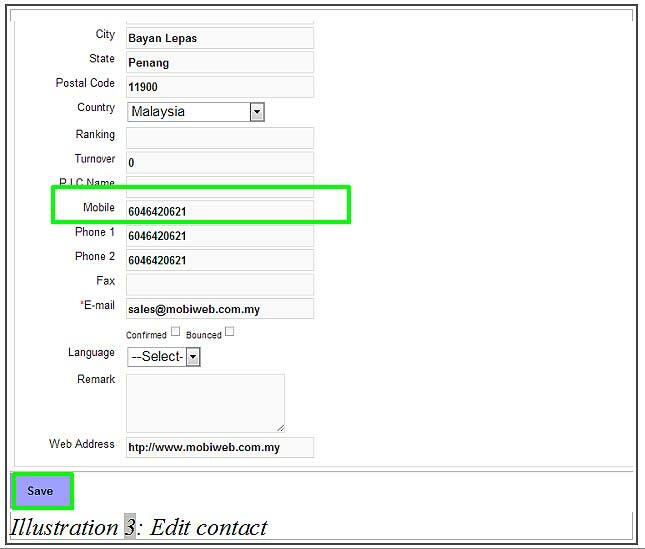 Below is an example on how to edit a contact’s mobile phone number (as illustrated below). Replace the mobile phone number and save it by clicking on Save button provided. 4. An alert message would appear for your confirmation. Click OK to dismiss the message. 5. Another message will be prompt to inform you that the details have been successfully updated. Click OK to dismiss the message. 6. Now, go to your contact list to view your newly edited contact’s mobile number. The same steps can be applied in amending your customer’s address, email address and etc. 7. Now, if you wish to delete a contact person instead of edit it, go to Del on your right hand side of your contact list as highlighted in the illustration below. The Del here is a abbreviation for Delete. Select the contact person you wish to delete from BMO Inventory System and click on Del to delete the customer’s contact. 8. An alert message would appear for your confirmation. Click OK to dismiss the message. 9. Another message will be prompt to inform you that the details have been successfully deleted. Click OK to dismiss the message.